Archaeologists are story tellers that use (hopefully!) scientific methods to assist in chronicling past lives. Context is one of the most powerful tools at our disposal, and is a concept so basic that it is often overlooked. This installment of Dig It illustrates this idea using an example from the southern interior of BC. Future installments will delve deeper into aspects such as stratigraphy, stylistic dating and radiometric dating. Imagine I have passed to you the object in the photo and asked you to discuss it. Upon examination, you see that it is a thin, flat, sedimentary rock, about 4 cm by 8 cm, with what appears to be two notches removed from the sides: hardly a ground-shaking discovery. The only real clue is that, since I am an archaeologist from the southern interior of BC, you think it might be something more than “just another rock.” In isolation, this object does not provide very much information to tie a story to. The story so far, “a little flat rock that might be an artifact” is hardly riveting, is it? However, when we place this artifact in the context of other, similar looking ones found in archaeological sites around the southern interior, and combine it with information gleaned from ethnographic accounts and traditional First Nations knowledge, it looks like it might have been used to weigh down the bottom edge of fishing nets. Now we have the first beginnings of a story! Still, “someone, somewhere, at some time, might have used this rock for fishing,” is a rather bland tale. We now add more layers of information about this artifact. It was found at an archaeological site overlooking a lake in the southern interior of BC where fish, including Kokanee salmon, lived. It was found in association with over forty very similar artifacts, all at about the same depth, scattered in a linear fashion for about 4 m, perhaps showing where a net was left hanging to dry. In this site very little fish bone was found, even though large amounts of deer bone were recovered, suggesting that bone preservation would be good. The only other obviously fishing-related artifact was a small antler harpoon point in the second photograph, recovered from a nearby archaeological site, also overlooking the lake. Now, we are getting somewhere! We have the foundation of a pretty good story, but the question “where are all the fish?” still puzzles us. One of the great privileges that we, as archaeologists, have in Canada, is that we get to work within a complex web of knowledge regarding past lives that extends from living memory, far into the past. Tapping into this treasure of information (through research and talking to local First Nations community members), we find the final keys to the puzzle. First, this area is specifically known as a fishing location. Second, the local cultural practice was, and still is, to return the bones of fish back to the water once processed. Though artifacts are interesting objects in and of themselves, when considered in isolation, they only take us a short way towards understanding the past. This is the underlying reason why it is so important to leave artifacts where they are observed. Without recording the context, archaeologists are not story tellers, merely treasure hunters. 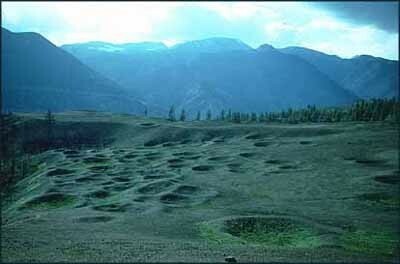 There are many types of archeological sites recorded around the world. Most readers will likely be familiar with the largest and most famous examples, such as the Pyramids of Giza in Egypt, Stonehenge in England, Chichen Itza in Mexico, and Machu Picchu in Peru. Though these are fascinating sites, and are well-marketed and well-travelled as a result, they are generally quite rare. They also often represent special-use or sacred areas, and don’t necessarily reflect what the everyday life was like for an average person at the time. While less-obvious sites might not be as impressive to the public, archaeologists tend to get excited about them as they provide valuable insights into the day-to-day activities of people’s lives in the past. And to ‘us’ archaeologists, that’s what’s really exhilarating to learn about. While the combination and variety of archaeological sites in our local area varies, there are number of common site types we tend to see repeateldy. This aim of this column is to provide a description of some of these sites, and how archaeologists know what they are when we find them. Lithic scatters: stone tools are created through a process called flintknapping, and a surprising amount of lithic debris comes off the core rock during the flintknapping process. The debris that’s left behind on the ground become lithic scatters. We rarely find archaeological sites in the regions without this lithic debris on or below the ground surface, often both. These generally consist of tools, tool fragments, or sharp pieces of lithic ‘stone-chips’ observed on the ground surface, or eroding out of sub-surface ground exposures like cut-banks, or tree throws. Faunal scatters: similar to lithic scatters, but are created from animal bone fragments instead. These types of sites are usually created during butchering, processing, as part of cooking activities, or discarded after consumption. They are usually expressed as weathered bone, or bone fragments, also observed on the ground surface, or eroding out subsurface exposures. Cultural depressions: this is a ‘catch-all’ phrase used to describe what we see in archeological sites that represent a few types of features. Larger depressions are often collapsed semi-subterranean pit houses, or house pits; this is what remains of the homes people lived in. Smaller depressions are often cache pits (used to store food, or other valuable items) or roasting pits (used to cook food). These look very much like you would expect, depressions in the ground of varying size and depth that are circular in shape. These were usually created by hand using a digging stick (imagine, no metal shovels or machinery!) and have a rim around the circumference of the depression, created by the dirt that was scooped out to create the pits. Culturally modified trees (CMTs): trees were frequently modified for a variety purposes in a manner that leaves the tree scarred, or modified, for the remainder of its life. Most commonly seen locally are bark stripped CMTs, where the bark was removed to create a marker along a trail, or for use as food, medicine, or to create useful items. With these, the scar doesn’t heal, the tree, and associated lobe around the scar, continues to grow. Young trees were also split, bent, or tied in knots, often to mark a trail, or a spot with cultural significance. 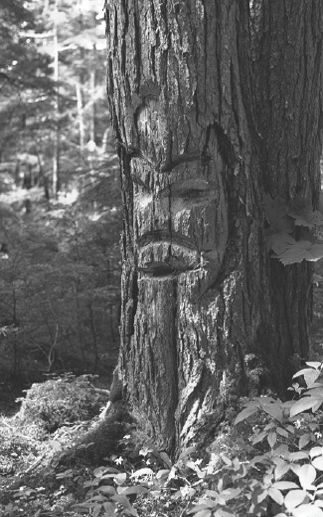 Less commonly observed are arborglyphs, where shapes, faces, or symbols, have been carved into trees. Rock art: pictographs are a common type of rock art. People drew anthropomorphic (human-shaped) or zoomorphic (animal-shaped) figures painted on rock, usually with a mixture of ochre, and animal fat or fish eggs. Less commonly recorded however, are petroglyphs, which like arborglyphs are shapes carved, or pecked, into rock. Recognizing an archaeological site is an exciting experience, even for an archaeologist who has likely recorded dozens of sites! It’s important to remember that these areas are important cultural, and sometimes spiritual, links to the past. Furthermore, it is unethical (and, depending on the location, illegal) to disturb them without proper permissions. If you do see any archaeological sites while out and about, remember to take only photographs, leave only footprints, and if you have any questions you can contact your local friendly archaeologists. If you’re one of the many Canadians spending this week sitting around a cut and dressed evergreen in the house, you’re part of an age-old human relationship, a unique tradition we have of mucking about with trees. Trees are a material cornerstone of pre-industrial cultures. In precontact BC, both interior and coastal peoples relied heavily on trees for raw material, even food. Because trees have the ability heal after material and food are extracted, our forests still hold the evidence of these uses, if you know what to look for. These distinctively scarred trees are referred to as culturally modified trees (CMTs), and are a unique and disappearing kind of archaeology. So what were people doing with these trees? In short: everything. In the way that hunting people expertly use every part of an animal, forest people expertly use every part of the tree: from fresh fir fronds for bedding and sweeping, through the woody trunk for building, all the way down to the teeniest stretchy rootlets for stitching and basketry. Bark from cedar, sage, juniper and cottonwood was removed with bone and antler peelers, shredded and pounded until soft, then woven into textiles. The sappy cambium (inner bark) of pine was eaten fresh in the spring, peeled from the tree in long juicy “noodles”. Late-season cambium, less sweet and tasty but flexible and with important antibacterial properties, was used as a packaging for food and bone implements. Pine, spruce and subalpine fir (known also as balsam) were sought for their sticky pitch, used as a sealant and also as a powerful medicine for lung ailments. Long, gently curved branches of Rocky Mountain juniper and Saskatoon were sought for bows, and often the same tree was used year after year, leaving a trunk peppered with smaller cut branches. The wood itself, useful for so many purposes, could be obtained by falling whole trees or removing parts. The amazing western redcedar, central to the culture of Northwest Coast peoples, is uniquely suited to wood harvest: whole planks can be removed from live trees, which can be left standing for future use. Standing trees are also a medium for art and communication: images carved into the trunks have been interpreted as guardians, territorial markers or simply artistic expression. All these uses leave distinctive scars that slowly heal as the CMTs continue to live and grow, becoming living artifacts for archaeologists to study. Entire trees, cedar on the coast and cottonwood in the interior, were felled and then carved and steamed into shape to be used as sturdy canoes. Tall, straight cedar were carved into iconic coastal totem poles. These uses leave behind only the stump, or heaps of wood chips from carving that can be preserved in wet conditions and remain identifiable for centuries. Harvesting these all products requires special attention to season, growing conditions, tree health, age and size. Trees were carefully chosen for unblemished bark, straight branches, or sound trunks, and specific locations in the forest that bred these qualities were revisited by generation after generation. Archaeologists studying sites of modified trees can help recreate histories of Indigenous land use. Our ability to extract tree ring samples (using a tool called an increment bore) means that we can learn when the modifications were made, sometimes to the exact year. As evidence of traditional practices that have waned since contact, these biodegradable artifacts are slowly disappearing through natural processes and modern forest harvesting. Keep an eye out for them when you’re next out for a walk in the woods-for now they’re still out there, hiding in plain sight. The sprawling trail networks surrounding Kamloops allow us access to grasslands, mountain peaks, waterfalls, rock bluffs, and hoodoos whether by hiking, biking, or snowshoeing. As someone who regularly uses the recreational trail systems around Kamloops, one of the areas I find particularly interesting in archaeology is the location of ancient trail networks. As part of the pre-field planning before undertaking an archaeological assessment, archaeologists complete a thorough review of past archaeological work conducted in the local area. This includes identifying the location of previously documented archaeological sites and any cultural heritage information provided by the local First Nations communities. This can include the location of ancient foot trails. Unfortunately, many ancient trails are not documented. Historic maps produced by the Hudson’s Bay Company, early mining prospectors, and ethnographers can be a useful source to help identify ancient trail locations and routes. Early explorers often spent considerable effort drawing maps of the local area and the trails depicted on the maps were almost always originally established by local First Nations communities. Besides travelling by boat through lake and river systems, travel by foot (and later horses) was the primary means to move around the landscape in the past. Trails networks were used extensively to access resource gathering locations, such as fishing, fur trapping, or berry picking areas, to interact and trade with neighbouring groups, to access important sacred and ceremonial sites, and general day to day travel throughout a region. Travel corridors generally followed a logical route over the most favourable terrain for foot travel through varying landscapes ranging from open grasslands in valley bottoms to steep mountain passes. These trail networks covered distances of thousands of kilometers. In many cases, trees along the trails were marked in various ways in order to assist travellers with wayfinding. Blazed trees marked with axes or intentionally bent trees are sometimes found at intervals along trails in order to mark the route. The bent trees are referred to as trail marker trees with the bend in the tree indicating the direction of travel along a path or at a trail junction. Sometimes when the trail bed is overgrown from disuse and difficult to see, archaeology field crews can locate the path of a trail by following trail marker trees. For an archaeologist, finding a segment of an ancient trail is an exciting process. If archaeology sites are found along the trail, such as stone artifacts, it further highlights the antiquity of the use of the trails. This summer, less than a hundred meters away from a major highway, the archaeology team I was working with came across a portion of a trail in a thickly shrubbed area. Once we cleared some of the brush out of the way and followed the trail, it became evident that it was an overgrown pack trail. The trail was about one metre wide and contained a well-defined and level trail bed that was cut into the side slope of the hillside. The trail followed a fairly linear path skirting above the steepest portions of the landscape. We were able to follow the trail for a few hundred meters until it was lost at the junction with the current highway. Presumably parts of the pack trail followed the same path as the current highway. We were able to locate a second portion of the same trail several hundred meters away. In total we recorded over half a kilometer of the pack trail during our study and found numerous stone artifacts in the surrounding area suggesting the trail was used many hundreds of years ago. Unfortunately, development activities have impacted many ancient trail systems. Over the past two centuries, trails have been modified from foot paths to pack animal trails to wagon roads and eventually present-day paved highway and road systems. Although the look of the trails has changed over time, the purpose has remained unchanged – to transport people efficiently and safely across a vast province, including areas of high elevation and rugged terrain. The next time you drive through one of the many high mountain passes surrounding Kamloops, take a moment to consider the fact that for millennia people continually travelled and navigated similar routes by foot.